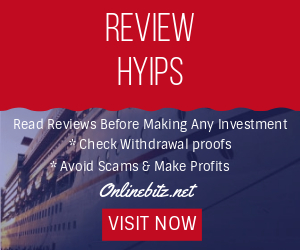 Onlinebitz.net is a daily updated hyip review blog where you can find the paying hyip list with withdrawal proofs. Before making any investment try to read reviews. • If you feel any information outdated or incorrect, please write us to update it. If You Want To "Publish Your Ads" On Our BLOG, Give Us a message via "LiveChat" or Mail us. For review article & banners request, please contact us directly.